Within each of the groups there are several services, each run by a service director who takes responsibility for the management of employees. Gateshead Council’s Direct Delivery and Traded Services (Street Scene) provide a range of integrated services to help keep the environment in which people live, work and spend their spare time in a clean, safe and attractive condition. The service area includes vehicle and horticultural fleet management. The fleet management team is responsible for the Council’s Operators licence and in-house vehicle maintenance provision. The service also delivers an in-house driver training programme. Vehicle procurement is carried out by the service on behalf of the various departments listed above. Gateshead Council and its partners have a reputation for delivering achievement, innovation and vision. In these times of financial constraint, we have challenges which will only be achieved by everyone within the organisation working together and doing things right. We have been involved with Driving for Better Business for a number of years and have benefited from excellent support in our efforts to improve work-related road risk. They offer valuable resources and opportunities for information sharing. All drivers are provided with a copy of the Gateshead Council ‘Driver’s Handbook’ containing detailed procedures and guidance. The Council has undertaken a global review of methods over the past 10 years and has adopted an action plan that considered the initial vehicle purchase through to end of life disposal. Gateshead Council ensures that all drivers are aware they are legally responsible for their own actions whilst driving, including adhering to all traffic regulations. All employees are considered to be ambassadors for the Council. Drivers who use their own vehicles for Council business must ensure their vehicle is insured for business use and has a current MOT certificate, as well as making sure their vehicle is appropriately serviced and maintained. A practical driving session. The driver is assessed according to 14 criteria (including observation, use of mirrors, use of speed, road positioning, separation distance and maneuvering). Drivers are also required to demonstrate daily vehicle checking procedures and completion of driving records. A driver should always be assessed in the highest class of vehicle they will operate. Drivers are supplied with additional information, including safe driving tips, fuel-efficient driving tips and a copy of the Highway Code. A road safety DVD and vehicle checking DVD are also shown. Following the assessment, feedback regarding performance is sent to the driver’s Line Manager, and includes any comments made by the assessors. The assessment programme is constantly under review with the aim to continually refresh the information provided and implement improvements. Feedback questionnaires are periodically used to gain views and comments from drivers. Any driver found to be at fault in an accident or guilty of a road traffic offence must go through the assessment process. Drivers new to Gateshead Council must complete an extended driving induction. Assessors carry out an interactive demonstration encompassing procedures including daily vehicle checking, completion of daily log sheets, fuelling of vehicles, defect reporting and accident reporting. Spending time one to one with the assessor is an effective way of familiarising the driver both with the vehicle and any Council procedures. The fact that assessments are carried out within the Fleet depot helps drivers to understand the service being provided. Results of the driver assessment form part of the information used to risk assess each individual driver. Accident records are also monitored as well as driving offences and endorsements. If a driver is regarded to be a high risk, then appropriate action is taken – in some cases more in-depth external training is also provided. The handbook is reviewed regularly and whenever there is an update all drivers across the fleet are supplied with a new document. Posters and leaflets are displayed in all depots and Council buildings. Information includes warnings regarding speed, tiredness and drink driving as well as guidance on daily vehicle checking etc. The Fleet Service ensures there are regular driving items in departmental briefing agendas, and global Council emails. It is important to constantly review and update all information passed to employees. Responsibilities/procedural/safety information should be constantly reinforced and repeated if necessary. Whenever there is a change to procedures or any aspect of operational road risk, toolbox talks are created and communicated to drivers by Line Managers. Drivers must sign to say they understand the information provided. All drivers must carry out daily checks of the vehicle before operating. Procedures are demonstrated at the driver’s induction and then are reinforced constantly. It is important that any instruction is tailored specifically to the driver’s individual vehicle, as the Council fleet contains a variety of different vehicles including a range of specialised equipment. The completion of daily vehicle logs is another requirement. All journeys must be accounted for and authorised by Line Managers. Individual user departments are responsible for driver record keeping. The procedure is demonstrated at a driver’s induction and then the driver must show evidence of completed log sheets at future assessments. Gateshead Council has recently developed a Health & Safety Compliance Procedure. Employees can be issued with non-compliance notices if they are found to be in breach of health & safety rules. This includes breaches with regard to driving/vehicles. The system is designed to highlight bad practice and at the same time educate employees. Gateshead Council runs special briefing sessions for employee drivers who are under 24 years old. These sessions highlight the risks faced by young drivers, with the main aim of the programme being to create road safety awareness. Guest speakers have been invited to these events in the past, such as the Driving Standards Agency. 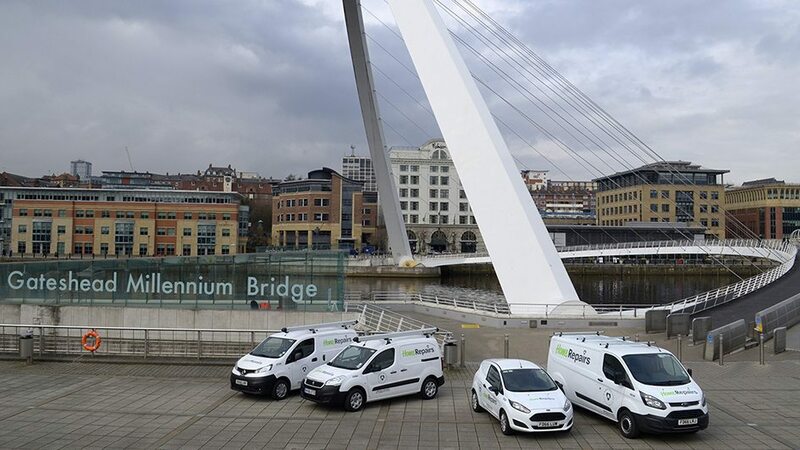 A number of Gateshead employees have been trained to provide Passenger Assistance Training, carrying out courses for both Council drivers and external contractors. The very nature of transport operations and legislation means that information and procedures require constant monitoring and review. The Driving Assessment scheme is constantly reviewed through regular meetings between Council Assessors and Fleet Office staff. Fuel Consumption levels are monitored across the fleet. Computer reports can highlight high usage of fuel or poor MPG. In 2013, a new fuel management system was implemented allowing access to data 24/7. Departments and individual vehicles can be compared. Accident data is continually appraised, trends identified and remedial action taken. A number of measures regarding accidents allow the Fleet department to identify important trends. Information such as cause of accident, journey details, road type and location is always recorded. The creation of a new Insurance team dealing with incidents has led to more robust investigations and more detailed feedback for managers relating to costs and damage. Data from driver assessments is continually monitored. Problems can be identified relating to certain types of vehicles or specific user departments. Poor performance in driving assessments can indicate that information is not getting through or communication is poor. Collation of information with regard to vehicle standards and cleanliness is helpful in identifying departments where communication needs to be improved. We have worked with user departments over the past couple of years to install vehicle tracking units to over 250 Council vehicles, including those driven by lone workers, care workers and 24 hour call-out units. The system records various pieces of information including periods of vehicle idling, breaking the speed limit and location statistics. Education and interaction with Line Managers has been vital in order to accurately interpret and communicate results (including monitoring of driving styles). In the last two years, the vast majority of Waste Collection HGV’s have been fitted with Bartec route optimisation technology. Vehicles are now guided on the most economical routes, which reduce dead mileage. Gateshead Council monitors its accident rate constantly. It operates a “No Blame” road safety culture enabling all road safety incidents to be reported without fear of penalty. It encourages its drivers to report incidents accurately using a clear accident report form. In instances where the Council is not at fault, we actively seek costs from the third party for damage to Council vehicles and it is important to make our drivers aware that this is happening. Following every accident, a full investigation is carried out including an interview with the driver. Following a near 30% decrease in accidents between 2004 and 2007, the total number of accidents have continued to fall. Contributing to this, have been our driver assessment and training initiatives, better driver communication and improved vehicle safety features – all new vehicles over a certain size are fitted with 56mph speed limiters. Gateshead Council maintains an active policy of drawing on best practice for information on Work Related Road Safety and disseminating it through its management processes. It is also actively engaging with local and national road safety organisations. When implementing road risk policies, Gateshead Council has found that to reap real benefits, all aspects of transport must be tackled, and that just to focus on driver competency and attitudes alone is not enough. Every aspect relating to the provision, management and use of transport has been examined in detail. To change driver culture, it was necessary to proactively engage with service users and produce a complete customer care package, including driver training, accident management, MPG performance, internal/external cleanliness of vehicles and vehicle abuse/misuse. Drivers must have confidence in the policy, and managers at all levels must be fully behind all schemes and programmes. In addition to the cost savings that come from fewer collisions, such as reduced repair, maintenance and servicing costs, the Council has also seen big improvements in fuel efficiency. 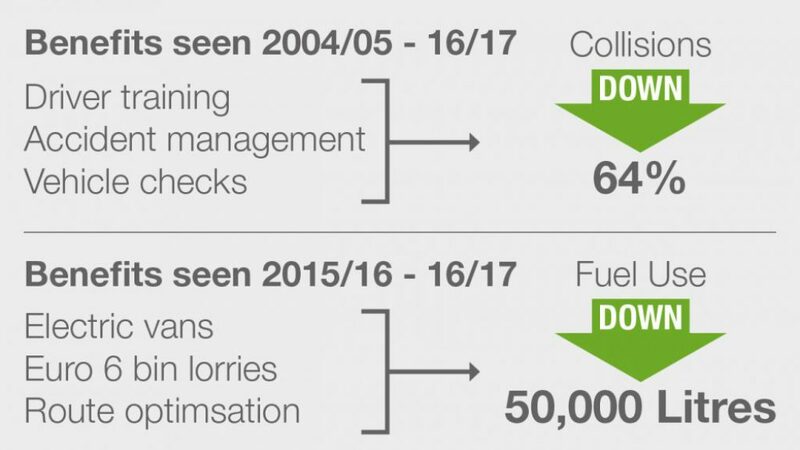 Various fleet safety initiatives, coupled with low carbon initiatives (such as purchase of electric vans, Euro 6 refuse collection vehicles, vehicle tracking/monitoring, improved utilisation, rescheduling work and reducing spare capacity) has led to thousands of litres of diesel saved. Analysis of fuel used across the vehicle fleet shows a fall in the amount of issues by over 50,000 litres from 2015/16 to 2016/17. Our work-related road safety systems are constantly re-appraised. The Council is vigilant to changes in legislation, and to new and emerging technologies, so that we are best placed to ensure a safe working environment for our employees and the general public. A project focusing on the Council’s HGV refuse and recycling fleet and how vehicles interact in the community has been undertaken. This has resulted in the recent installation of a 360-degree camera system in all such vehicles. The system includes various cameras, warning livery and an audible warning for cyclists when vehicles are about to turn left. We have recently put on ‘exchanging places’ demonstrations out in the community where cyclists can ‘exchange places’ with an HGV Gritter and refuse collection drivers to appreciate blind spots. All open back tipper vehicles, have this year been fitted with a fall arrest system and we continue to speed limit vehicles to 56mph. Driver behaviour is now also monitored using Lightfoot telematics technology. The Ashwoods Lightfoot programme has been installed in 10 vehicles to monitor driving characteristics. Simplistic warnings on the vehicle dashboard inform drivers if inefficient driving practices are identified (such as harsh acceleration). Subsequently, managers receive driving performance data. This initiative requires limited funding; however, the benefits are comprehensive. Drivers also receive immediate feedback allowing them to improve their driving style.